Microsoft should invest in eye tracking tech for their next phone. It seems that the one true thing about mobile is that games are usually the best sellers. Even windows 10 store results have shown that games are selling the most. So really, having a cool tech that allows eye tracking to create gaming experiences that are quite unique to windows mobile. The tech exists you can literally look around the world without using a right analog stick to do it. This topped with great screen tech that lets controlling games with a screen become 2nd nature like with gamepads. And obviously a great API that would allow developers to make great use of these technologies. I really hope MS does something like this. They are already working on a goal that would actually allow games to run across not only xbox one and PC but the windows mobile as well. And if they bring triple A titles into the mobile world that would be a huge thing. Another reason why purchasing valve or making deals with them should be part of the talks. Move the entire steam library into windows 10 store, provide the exact experience in a UWP app. And since this app will run across all 3 platforms, steamers would get exactly what they have today except across a range of devices. So I doubt anyone would be bothered by that. other mobile systems / other phones (name forgotten) seem to have a feature that can detect whether the user is looking at the screen. 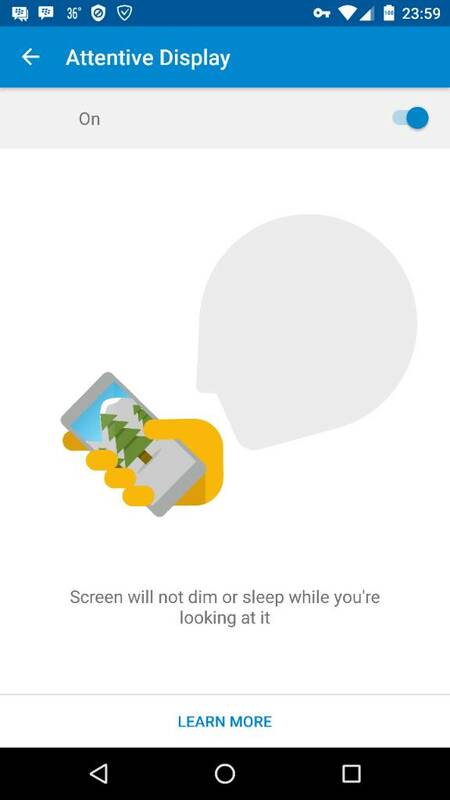 if the phone knows the user is looking at the screen, its screen will not go off even if it's been idled for long time. I like this feature and hope ms can implement it into w10m. My Moto X Pure Edition has this feature. Last edited by Laura Knotek; 02-05-2016 at 10:59 PM. I honestly thought that was the 'glance' feature. And I thought my 640xl had that. I occasionally look at the dark screen and then it would light up shows time and any notification. Maybe it was because I bumped it that caused it to wake up. Now that I have the 950xl, it does not seem to be doing it unless I bumped it. What exactly does the glance screen feature even do?? Have 640 xl glance settings can be off, peek, interval and always on. Peek behaves like what you described. I use off, and leave double tap to wake up. Does it work well? Samsung debuted this with I believe the Galaxy S4 (about 3 years ago). It also has automatic scrolling and orientation stay (or whatever it's called when it keeps the orientation matched to your face). However, the reliability wasn't perfect in my experience, but it did work. It works great! I've never had any issues with it. My default sleep setting is 15 seconds, but my screen never goes to sleep while I am looking at it. I am surprised the PEEK option is not available on the 950XL with latest Insider build. Well, time for another feedback submission. edit: just sent feedback on this. Incredible lazy programming to omit this feature, especially when the 950XL is touted to have iris scanner, but totally lack the best Glance Screen feature. Why even call it Glance Screen if it doesn't even do what it's supposed to do. The only option is to do dark AFTER a set time period. WTF??!! Even bumping it and slamming it does not even wake the screen up. Then it would randomly just wake up for no reason or Cortana would activate for no reason at all. Last edited by midnightfrolic; 02-06-2016 at 02:24 AM. Yah that feature is different though. I think windows Central did a review of eye tracking tech in games. It's a camera you add and literally you look around in the game and your character looks around instead of using the analog. It's pretty sweet. But a feature that triggers iris scan without the power button would also be cool if it can tell it's locked and you're looking at it. But then it may trigger falsely too. And likely battery would be eaten up constantly scanning. Seriously though I think that buying valve, moving it to UWP and having devs implement extra features because it could give them more sales would be a huge plus for windows mobile. Granted, these games are likely not made for ARM devices so MS would need an x64 phone. Or an easy way to port, like really easy. But games seem to sell the most on all platforms. Wonder if Microsoft will release the flip cover that acts as a second screen soon and you could create a gamepad on it. Apparently uses e-ink technology. Though it's with Microsoft Research. It would probably take them a while to release. Isn't peek the default? You set it for say 30 seconds. When it disappears you wave your hand and it shows up and disappears again after 30 seconds.At least that's how it works on mine. 15506 firmware and .71 os. ....... Apparently uses e-ink technology. Though it's with Microsoft Research. It would probably take them a while to release. That's what I'm thinking. Though Satya says he wants stuff from research to move quicker to consumers. I guess that's why hololens is such a big deal. Nah, I think eye-tracking is a gimmick until you can prove some really good use cases. It's more of a thing for the military right now. MS already talked about improving the FOV ages ago. Magic leap while sounds cool is way behind. They had a video of what they envision with them playing games. But the most they can do so far is get simple images to be viewed and there hasn't been any interaction models. Google has invested in them and cut off google glass. My guess is google will be part of producing the gear that will be worn. It's really about who gets there first. MS already has working games and such. Already has dev kits and all that. So it's a bit ahead. We will see if it takes off though. Magic Leap could come out with a dev kit in 6 months and everyone will jump on it immediately if the FOV and interaction model are immediately superior to HoloLens.